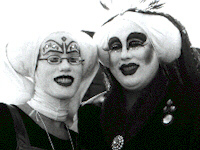 Only one day after announcing it, Sydney, Australia's Opera House cancelled a plan for the Sisters of Perpetual Indulgence to lead tours of the famed landmark during the gay Mardi Gras Festival. Opera House Trust head Michael Lynch said the Roman Catholic Church had expressed outrage at the announcement. "At the time the tour was planned last year the Sydney Opera House did not foresee that some members of the community would be hurt or distressed by the tour. I apologize to the Catholic Church for any offense," Lynch said. A spokesman for the Sisters replied: "Our main tenet is the expiation of stigmatic guilt. We don't set out to vilify Roman Catholic nuns. The Sisters are very disappointed by the cancellation of the tours." The court "read in" "sexual orientation" without physically rewriting the list, said Ken Popert, president of Pink Triangle Press which publishes the gay newspapers Xtra!, Capital Xtra!, and Xtra! West. The Opera House still will be the venue for the launch of Mardi Gras February 5. This year's parade is February 22. Festivities will wrap up February 27 with the famed Sleaze Ball. Last year, Mardi Gras pumped AU$100 million (US$629,229) into the New South Wales economy. More than two-thirds of young people in the state of South Australia support legalization of gay marriage, a new survey has found. The poll questioned 1,331 people between ages 13 and 25, according to the January 25 issue of the Adelaide Advertiser.